The RTD Beacon is a mobile app that improves people’s journey on public transit. Navigating the routes of public transit shouldn’t be difficult and frustrating. That is why we have created the RTD Beacon mobile app. The RTD Beacon improves users journey on public transit while connecting them with points of interest along their route. The app allows users to plan routes, purchase and store fares, and track transit in real time. If trains are running late, users receive notifications of delays and are able to see nearby places to grab coffee or find wifi while they wait. I worked as the UX lead, conducting user research, persona development, and user flows. From there, initial concepts were tested and iterated on quickly. Finally, we created high fidelity prototypes. I recently redid the final UI to refresh the overall look and feel of the app. We were asked to identify a problem—be it an experience, process, or product that we would like to improve upon. Our team identified public transit delays as our problem space and dove headfirst into creating a user-driven solution. Over a two day period, we funneled all that we learned about design thinking, user research, and rapid prototyping to create a thoughtful, meaningful solution. Being passionate about this solution, I continued to develop this concept further after the two days were over. The RTD Beacon allows public transit providers to form a closer relationship with their riders. Users can easily view and plan their upcoming transit routes in one central place. Beacon allows users to see where their bus or train is, receiving real time notifications if their selected transit option is delayed. No more searching for outdated schedules or forgetting your ticket at home. RTD Beacon allows users to see real time transit routes and navigate their journey on public transit with ease. With RTD Beacon, users are can quickly enter their start and end destination, as well as desired departure or arrival time to see the various transit routes to get them where they are going. Routes rarely start and end at transit hubs. 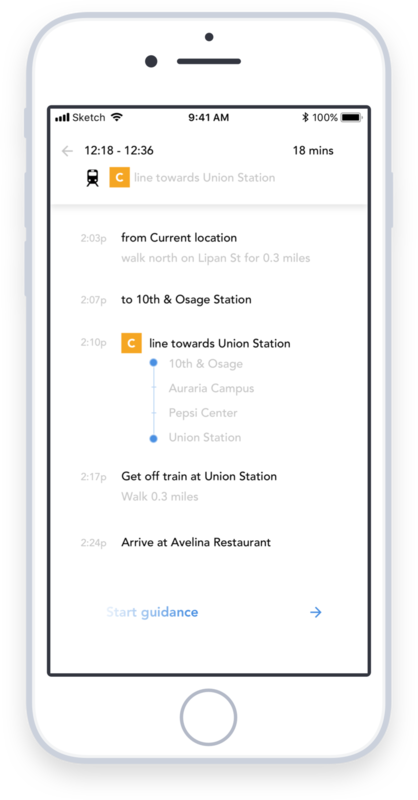 Therefore, RTD Beacon doesn’t just show the journey on public transit—it helps guide users from wherever they are all the way to their final destination is. RTD Beacon places real time trackers in busses and trains throughout the city, so riders can be kept up to date about delays. If a delay happens on the selected route, RTD Beacon will send a notification letting users know just how much time they have. Nobody loves when their journey is delayed—but it happens. With RTD Beacon, people don’t have to spend their extra time waiting in crowded transportation hubs. RTD Beacon helps users find nearby points of interests to stop along their way. Now, an 18 minute delay could turn into an enjoyable cup of coffee along the way! Intrigued by the recent negative experience I had on public transit, my team and I began to dive deeper to figure out if my own pain-point was common amongst other public transit users. We began researching top complaints amongst public transit users and spoke with a number of people to gain insights. Through our research, we identified that enroute delays were the number one complaint of public transit users. To gain a deeper understanding of how people used public transit, we spent time at a few transit hubs and took a few rides on public transit. We observed peoples behavior and emotions before, during, and after their actual journey on public transit. We began to explore who used public transit by speaking with users and observing busy public transit stations. Our research revealed a wide variety of users—young and old, rich and poor. From here, we began to develop personas that would be used to guide our design decisions. We used user scenarios to gain insights on the entire user journey and explore the existing behavior patterns of commuters. We focused on discovering all the touch points that users had with transit. 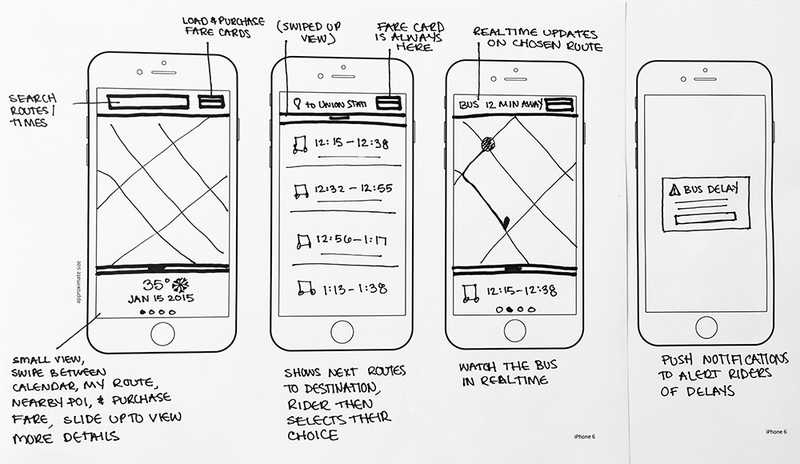 With the insights we had learned throughout our research, we began to sketch initial concepts for the app. After sharing our ideas and iterating, we then put our sketches into a quick prototype using the POP app.